Dassault Falcon Customer Service provides industry-leading support wherever and whenever it is needed. A dedicated team composed of Ops Specialists provides pilot assistance via briefings, meetings, operational seminars and Q&As. For in-flight pilot training, the Dassault Training Academy offers several training programs, which are customized to specific needs and customer location, and taught by Dassault’s team of 20+ experienced Type-Rating Instructors and Examiners. FalconCare® is a comprehensive maintenance cost program designed to help customers better manage their maintenance budgets through stable, predictable costs related to parts, labor and even AOG onsite events, with coverage up to and including C inspections. 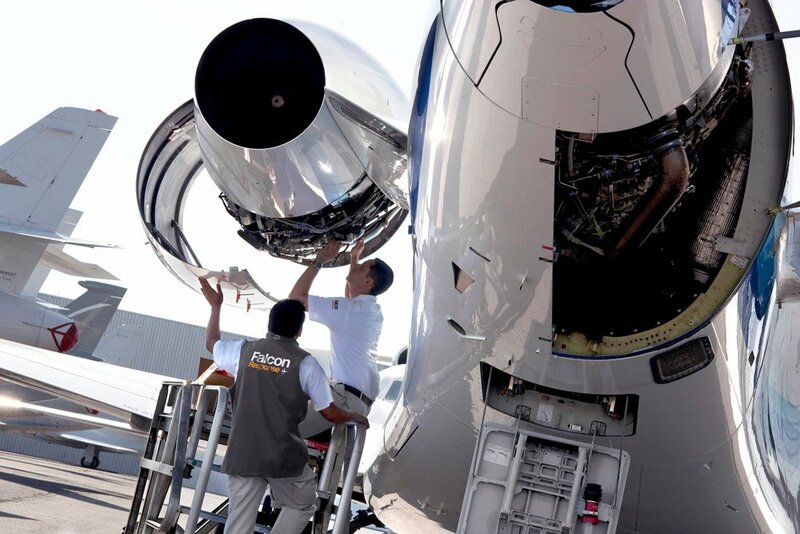 The program helps Falcon owners realize the highest value from their aircraft by providing them with total control over their maintenance budgets. It gives them access to a vast worldwide network of service professionals, ready to serve and support them and their aircraft. And it offers peace of mind that comes with knowing that your aircraft is receiving the best possible care. Falcon Broadcast® provides earlier, more efficient troubleshooting for a quicker return to service. Interfacing with the EASy avionics suite, Falcon Broadcast® gives real-time notification of maintenance messages and a “heads up” on aircraft component issues at all times. Falcon Sphere II® is a Dassault-designed integrated solution embedding operational-efficient applications to support pilots on the ground and in flight. This new-generation software optimizes browsing among applications, making it fast and easy. Dassault Falcon training solutions are designed and taught by highly experienced cross-functional teams of experts who apply the highest-quality skills training, all in accordance with aviation authority standards worldwide. Recognized as one of the best resources for operators in the business aviation industry, the Falcon Customer Portal is the go-to resource for maintaining and optimized Falcon aircraft. It is an interactive tool to stay informed of the latest technical information & service offerings.